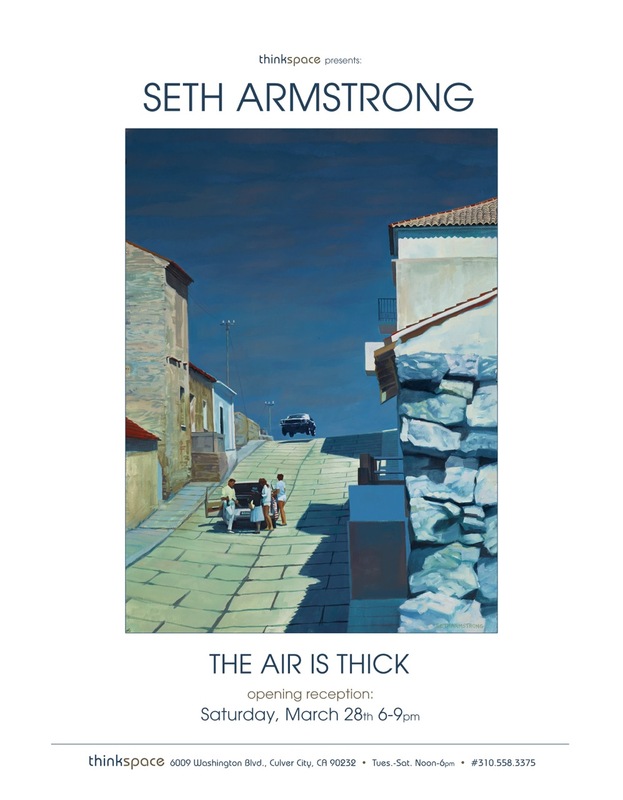 Thinkspace (Los Angeles) – is pleased to present The Air is Thick featuring new works by Los Angeles based artist Seth Armstrong. Armstrong’s paintings self-consciously capture a sense of looking, arresting moments with cinematic detail and voyeuristic curiosity. Varying in scale, the paintings offer views that are alternately intimate and vast, moving expertly between the monumental and the minute. Laden with detail and suggestion, each piece offers a moment in the trajectory of a larger narrative, and the viewer is compelled to realign the fractures of these inconclusive moments. Hanging the works on suggestion rather than on the overt, Armstrong builds tension and excitement in every painting with the possibility and expectation of action. Surfeited with this palpable sense of permanent anticipation and arrest, the air is indeed thick enough to cut. 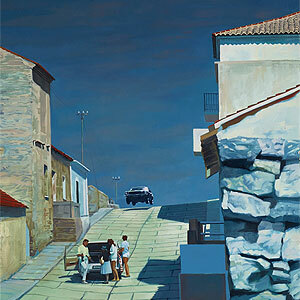 Originally from Los Angeles, Armstrong studied painting in Northern Holland and completed a BFA at San Francisco’s California College of the Arts. His deft handling of oil paint clearly demonstrates a facility inspired by traditional painting techniques, and a material aptitude for the dense capture of light and color. The intense realism of his style is often tempered by a looser, more painterly approach, and by a stylized handling of light and dimension. With viscous luminosity and substantive flesh, qualities achieved with a seamlessly clean application, his works feel heavy with tactility and dense with tangible space and body. Armstrong’s use of stark saturated contrasts is offset by a tendency towards stylized hyper-color, creating both depth and edge that exceeds the muted tones of the real. These contrasts achieve a sense of brooding visual tension that manages to evoke both nostalgia and strangeness simultaneously. In The Air is Thick, Armstrong continues to explore themes that have consistently fascinated his output: the intrigue of illicit looking, and the fine line between intimacy and trespass. Just as cinema manages to satisfy our innate love of voyeuristic access, so too do the paintings offer us views onto private lives that both frustrate and satisfy. The suggestion of constant narrative pervades even the stillest and least active views, as Armstrong reminds us of the secret recesses behind all closed doors and all quiet faces.